Take a walk down 24th between Mission and Potrero and look up. 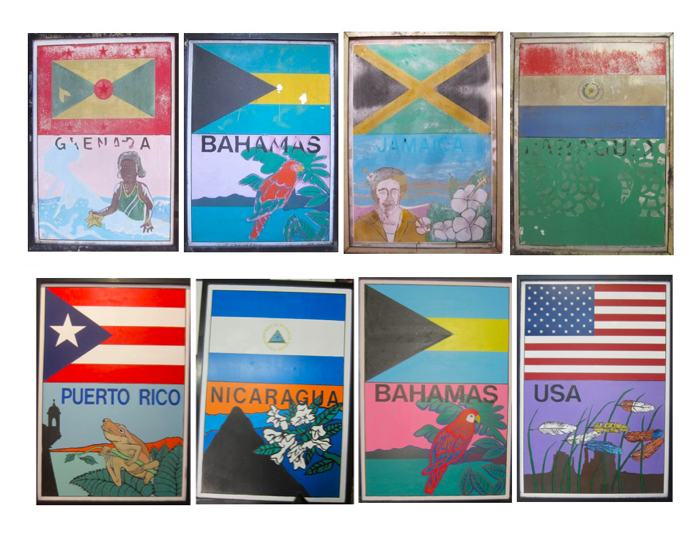 The Flags of the Americas are back, each one a colorful homage to the national identity and symbols of the continent. 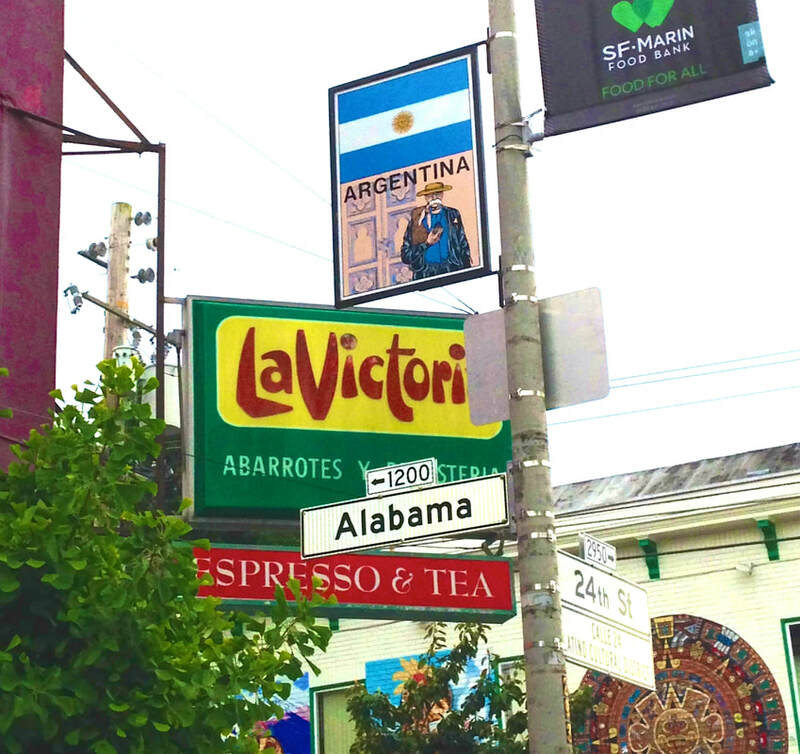 Attached to street poles along the 12-block stretch of the Calle 24 Latino Cultural Corridor, the mini-murals have been preserved and restored, thanks to work undertaken by Precita Eyes and funded by a Special Project Grant from the Mayor's Office. The original metal banners were painted in the 1980s and stood sentry over the street for 30 years. But sun, wind, and rain took their toll, deteriorating the artwork and fading the lettering. So much so, that many people had never noticed they were there. Top row shows the deterioration of 30 years in the elements. Bottom row shows national symbols in their newly restored glory. That was the case with Precita Eyes conservation technician Yano Rivera. “It's hard to do when you aren't familiar with the original,” he explains, because the goal is to mimic as much as possible. Instead, he relied on respect and intuition. “Uncertainty slows you down,” Rivera notes. 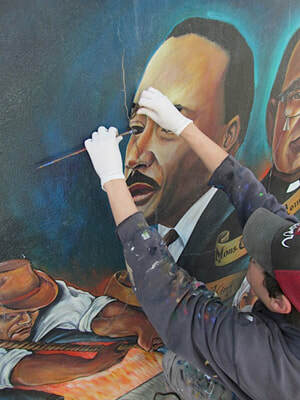 Piecing together details from both sides, studying unfaded areas, and examining the silhouettes of disintegrated brushstrokes are the most labor-intensive part of the project. Then there's the process itself: washing away grime; scraping away the old vinyl lettering; creating a layer of varnish over the remaining original paint; mixing new paint to match the original colors; and repainting the original artwork. An acryloid coating with UV protection ensures vibrant colors and graffiti protection for years to come. The restoration project began in May 2016. All 27 flags have been restored and almost all are back on the street. 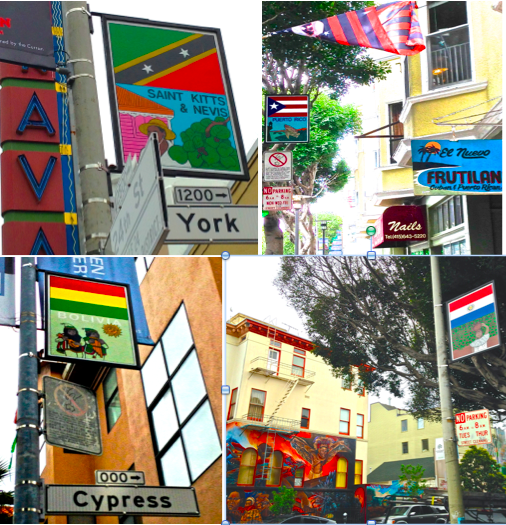 The flag restoration project is a “cultural, visual representation” that celebrates the Mission district's Latino identity, according to Joaquin Torres of the SF Office of Economic and Workforce Development office, as reported in Mission Local. SAVING FACE: Detail from the restoration of "500 Years of Resistance," St. Peter’s Parish at 24th St. and Florida. The mural was created in the mid-1990s by Salvadoran muralist Isaias Mata, and restored by the artist in 2012.